Bill and I went on a little jaunt this week to Grosse Pointe Shores this week to see the Christmas decorations at the Edsel and Eleanor Ford home. They call it a home, you and I would call it a mansion. The Albert Kahn design masterpiece was so inspiring - an English Tudor plunked down on the edge of Lake St. Clair. I loved the fact that despite it's huge footprint, the rooms seemed intimate. The more public rooms were English Tudor and the more personal family rooms were in the new to them style of Art Moderne. Gorgeous. This Christmas tree was the only allowed photograph in the home. Interesting fact: the water drop glass baubles on the 1950's tree were made for Eleanor Ford by the glass factory at Ford Motor Company explicitly for this tree. Yes, the rich ARE different. 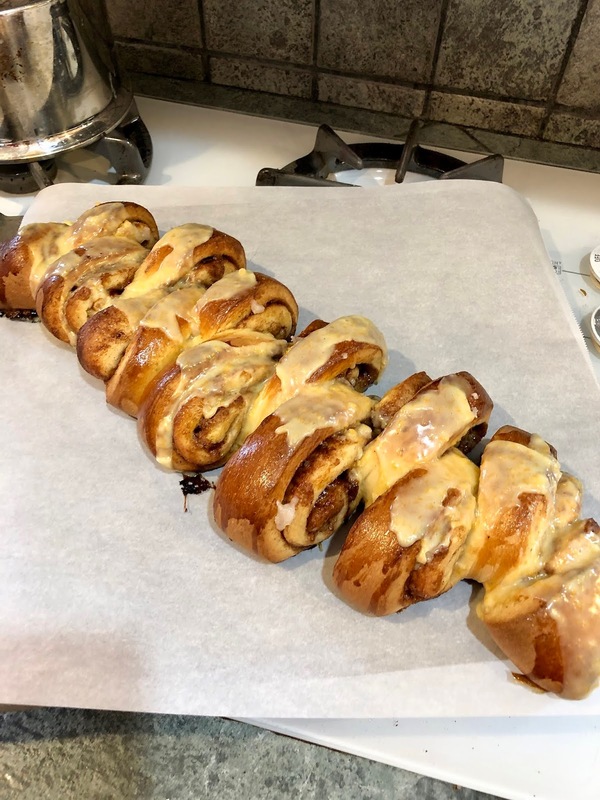 My attempt at some Christmas cheer - this Kanellangd - a Swedish cinnamon bread. While it looked beautiful, sadly it didn't really turn out. Paul Hollywood's recipe was in Celsius and when I converted it to farenheit- the 438 degree oven temp seemed too hot. Well, he's the bread expert, right? I put it in the oven at 425. Yes, too hot. Bottom burned and center still needed baking. Next time I'll try it at 400. Also, it was my first attempt at instant yeast instead of active dry yeast. I'll try it the other way next time. My Indigo Revival is almost done. I should have a finished photo on the blog next week. This is this week's block designed by Jo Morton. Rolling Stone instructions are HERE. I got a lovely surprise from Hollyhill Quilt Shoppe - they sent me 3 little Christmas trees that are in the Minick and Simpson style. Thank you Brian and Jan! What else is new? Well I had an eye doctor appointment last month and he said I needed to change my prescription. 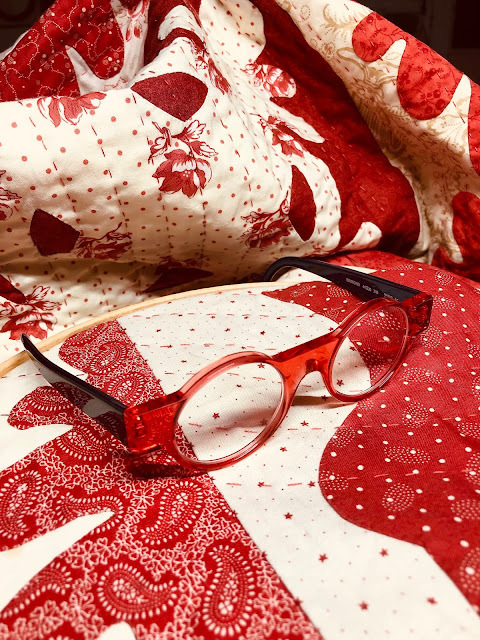 New lenses need new frames, don't you think? Polly and I just got back from a long weekend in New York City. It's always grand this time of year and the sights and sounds are thrilling. The street seemed even more hectic and crowded this year. I guess everyone wanted in on the holiday cheer. 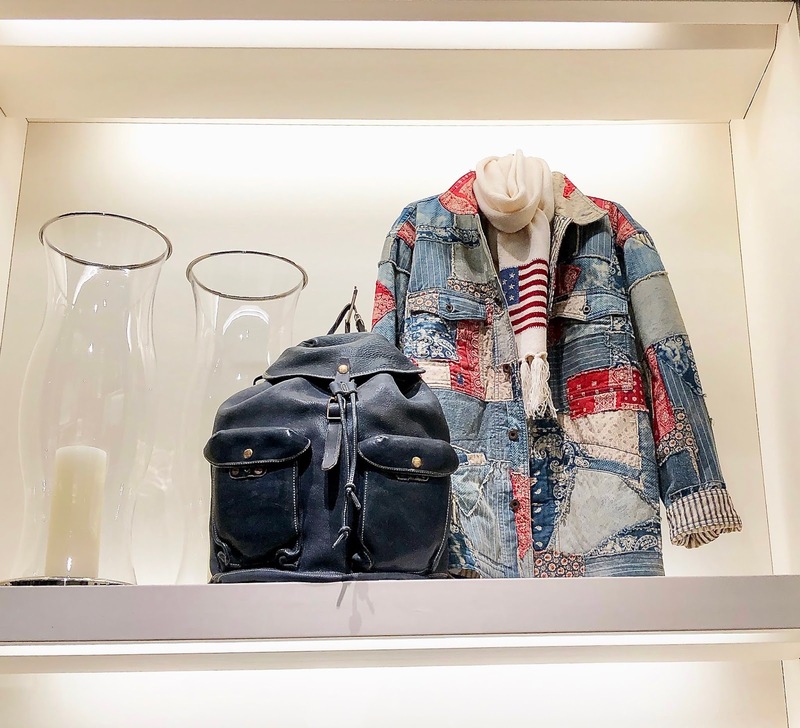 Among some of our usual haunts, we wandered over to the Ralph Lauren flagship store. This jacket wanted to go home with me. Alas, it was made more for runway models than style conscious, old fat ladies. 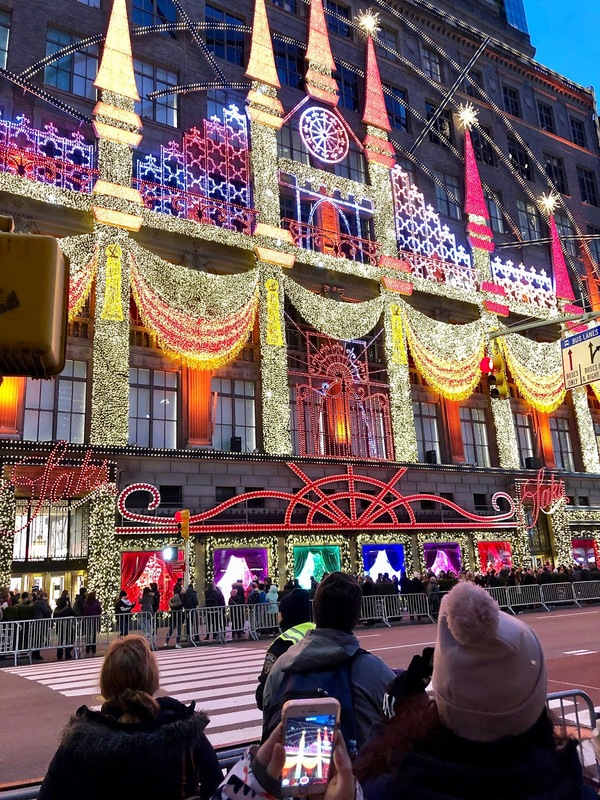 This is the last year of Saks Fifth Avenue's flagship store near Rockefeller Center. They are going out with a bang. The light show was magnificent. 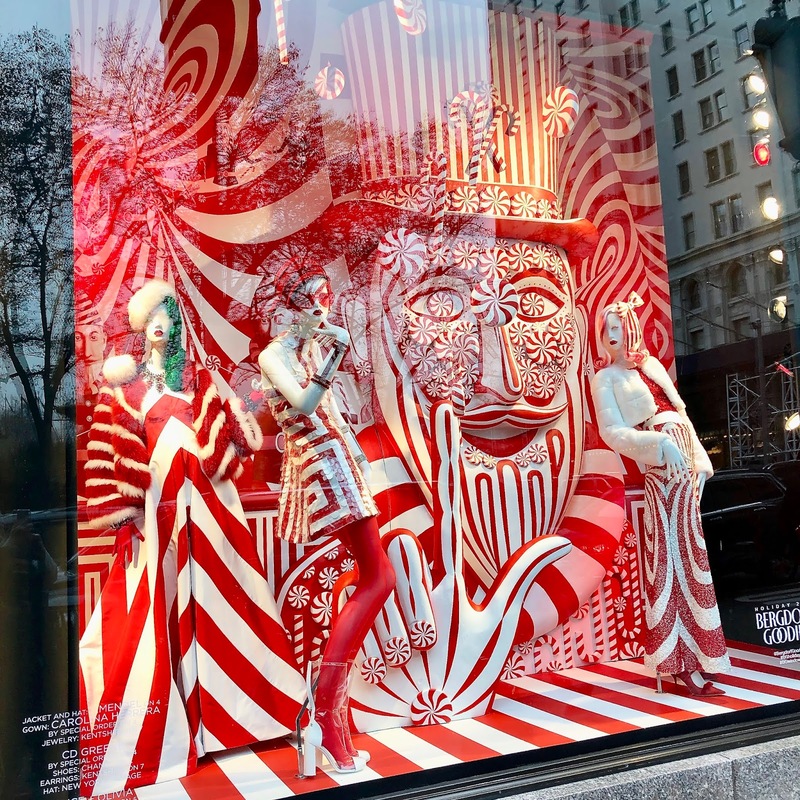 The windows at Bergdorf's didn't disappoint either. This red and white one seemed to be everyone's favorite. Mine too. 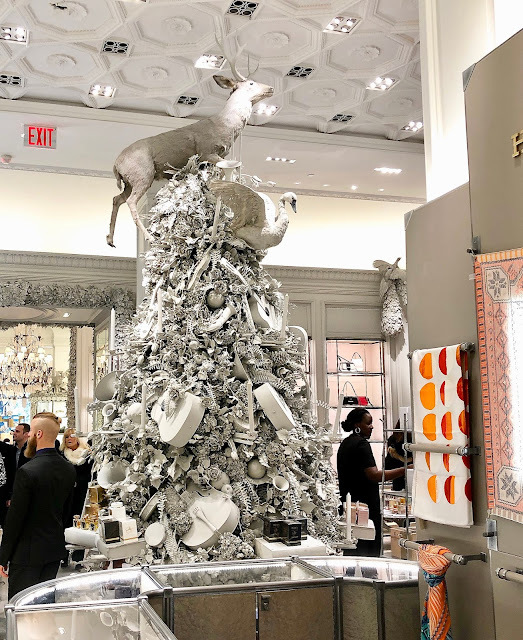 Inside, it was pretty stunning too - this tree topper goes to the top of the list. even simple tree ornaments make a big statement. 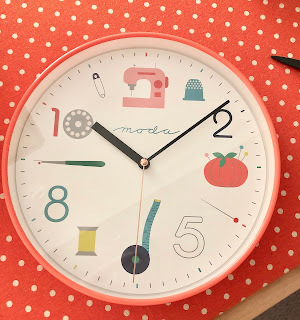 Don't you love how you can look at an applique pattern and KNOW whose hand designed it? 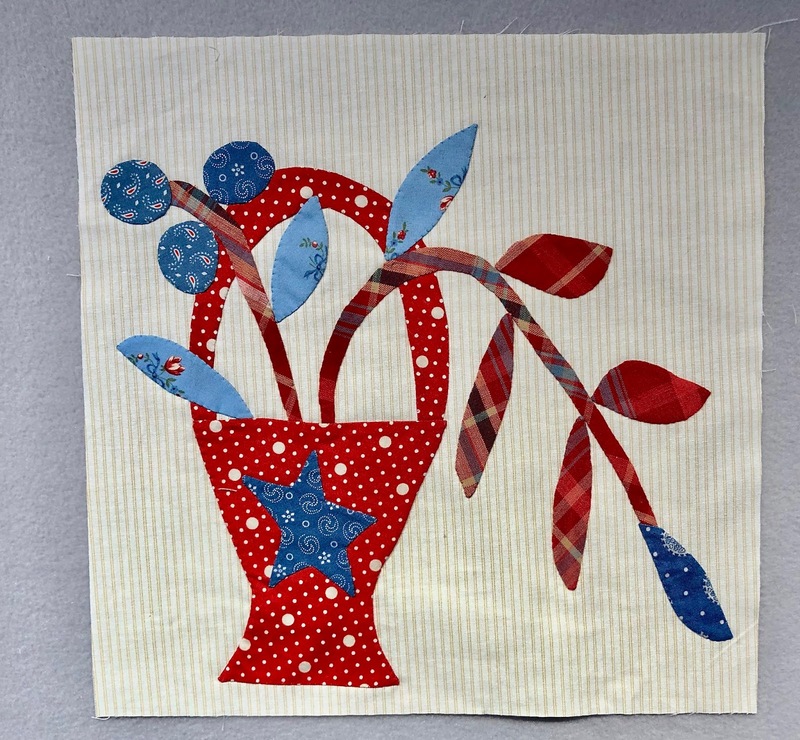 Even with my fabric choices - there can be no doubt that this week's block is designed by Jan Patek. You can find the pattern HERE. 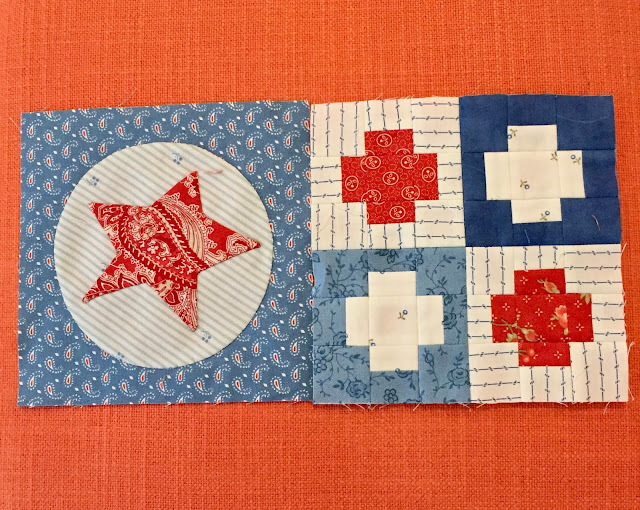 Thank you for the beautiful block, Jan! I've started quilting my red and white Indigo Revival quilt. I feel very festive in the evenings when this is in my lap. While I am quilting, this is Gibby next to me. 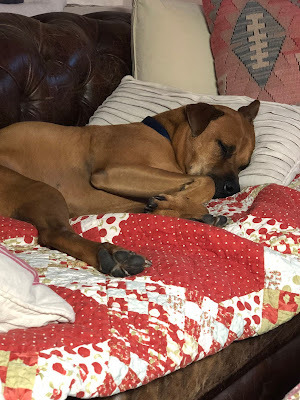 He waits by the side of the sofa until we put a quilt down, then he arranges himself AND the pillows until he is just right. That is the boxer in him - he is very skilled at moving things around with his paws. Crazy, right? What is actually crazy is that we oblige him. Polly and I are off on a little adventure tomorrow. Block 33 is brought to you by Stacy Iest Hsu. 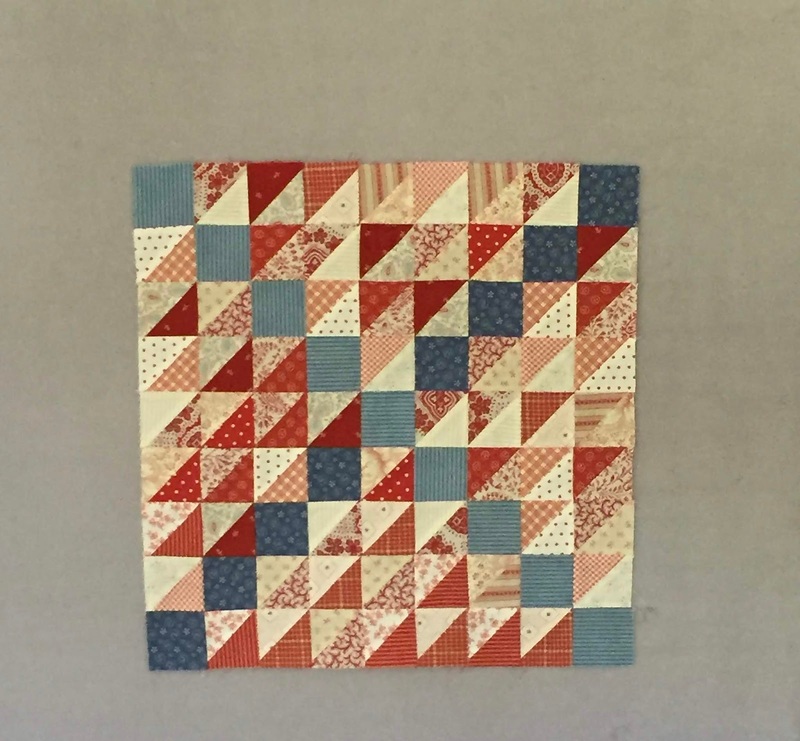 I mixed in some 3 Sisters pink with my Minick and Simpson red, white and blue. You can find the directions HERE. Our refrigerator was delivered so we will have roast turkey this weekend. A little late, but yummy just the same. I am in between projects. 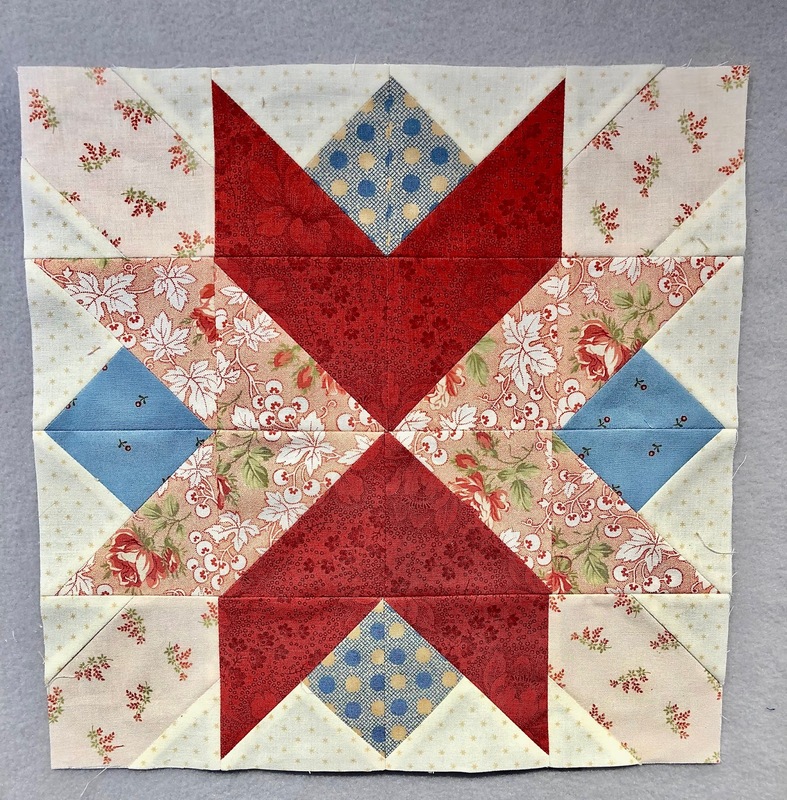 I'm getting my red and white quilt back from being basted this week. 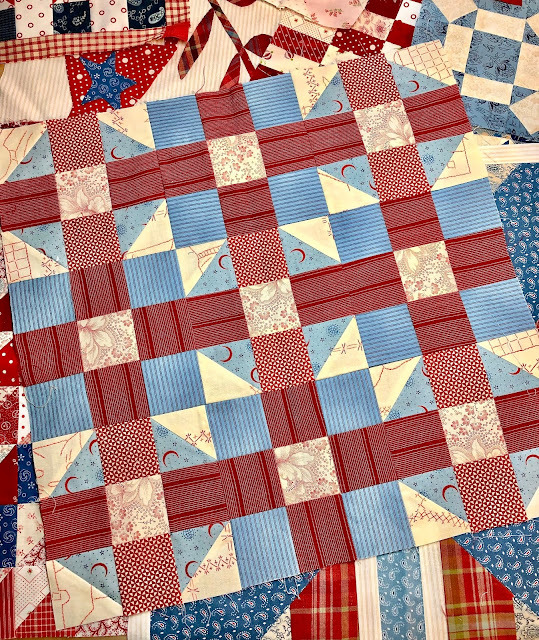 Hand quilting will start on it immediately. New strike offs will be delivered too - for our next collection that will show next spring. So - that awkward in between project phase happened and you KNOW I cannot sit without some stitching in my hands.....so this was born. I dug into my prized box of Japanese taupe fabric bits and pieces. With the help of some purse hardware and a stack of Yoko Saito books - I made myself a bag. 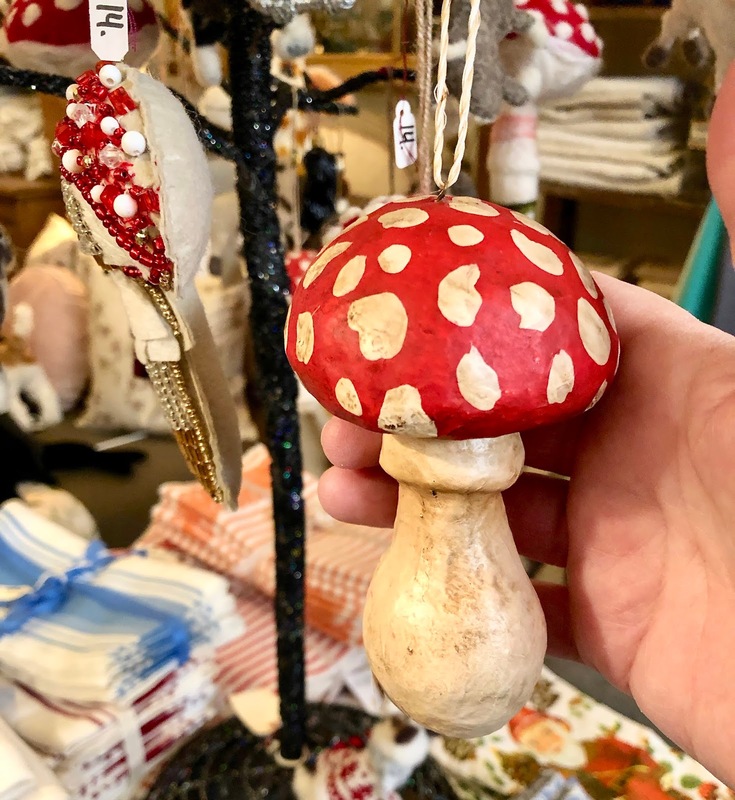 As I mentioned on Instagram, it would make a lovely evening bag - if I ever ventured out socially in the evening, that is. :) It will probably live as a stitching bag - holding bits of fabric, thread and needles when I stitch on the road. The Christmas tree was put up. 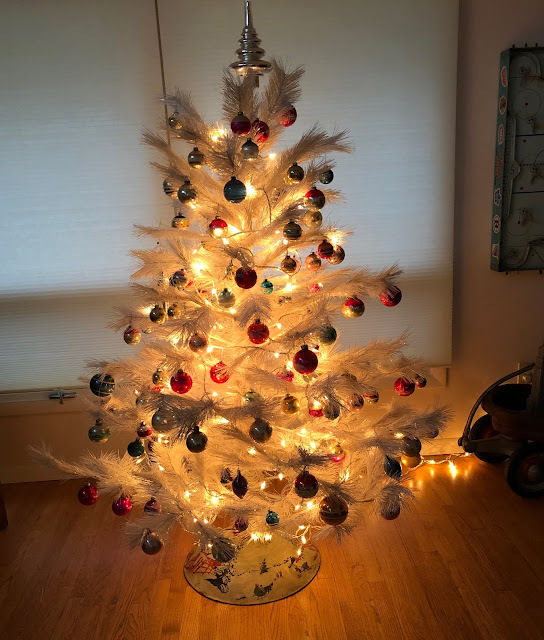 A 1950's artificial white tree was scored on Ebay several years ago. I was searching for one because I also found this vintage tree stand. 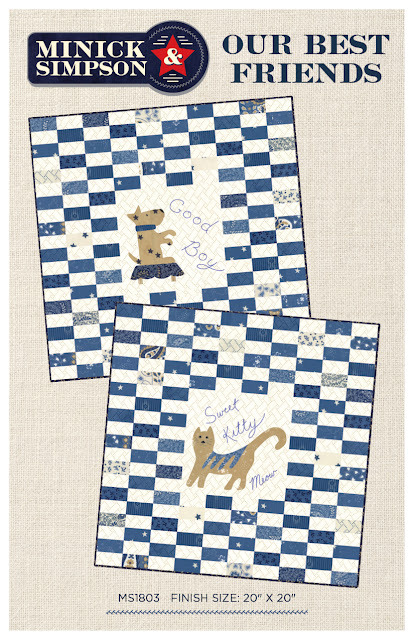 This, 5 red and white quilts on the walls, and some stockings are it for Christmas decorating. 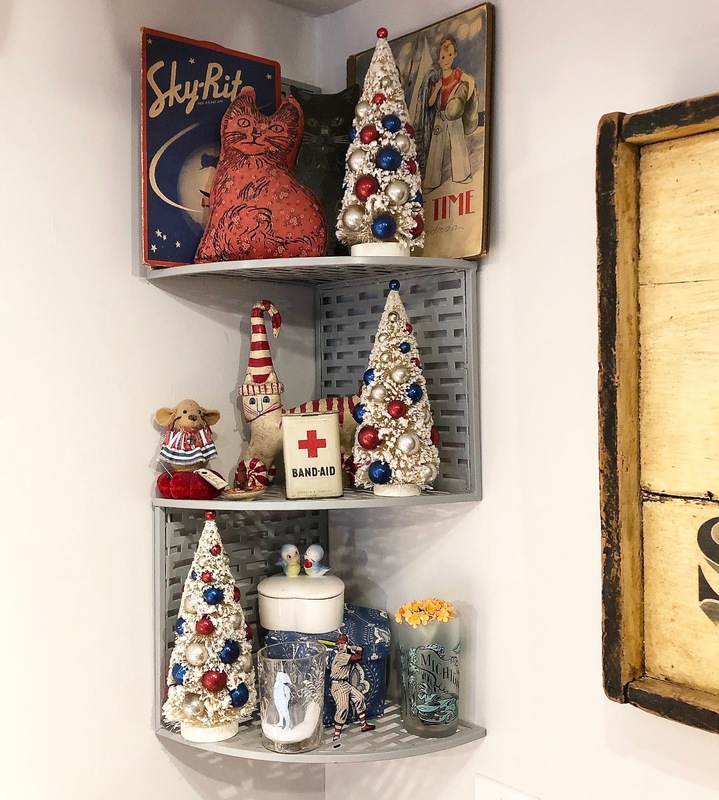 I have bins and bins of Christmas stuff in storage, but my tolerance for clutter gets weakened every year. Soon, you can expect the quilts, a candle, and sprig of holly as the entirety of holiday decorating around here. I get an unexpected break from cooking Thanksgiving dinner here this year. Our refrigerator died last week. Did you know that that you can't just walk into a store and buy a white French door refrigerator? Nope. It has to be special ordered. It looks like it will be delivered late today. Just a little too late to go out and buy and turkey and all the fixings for dinner tomorrow. Do not worry. Restaurant reservations have been made. Since I last posted on the blog, not only has the refrigerator given up the ghost, but Bill's and my iPhones are gasping their last breath. Here's hoping there will be a surprise deal somewhere on Black Friday or Cyber Monday. The iPhone issue is why I couldn't post last week on the blog - no photos. My red and white quilt top was finished this week. It is on it's way to be basted and it will be my winter hand quilting project. The pattern is Indigo Revival (the original was done in blue and cream) and it is available as a download in our Etsy shop. Week 30 is brought to you by Brigitte Heitland from Zen Chic. You can find the directions HERE. If you look close, you might see a difference in my block. Yep. I screwed it up. 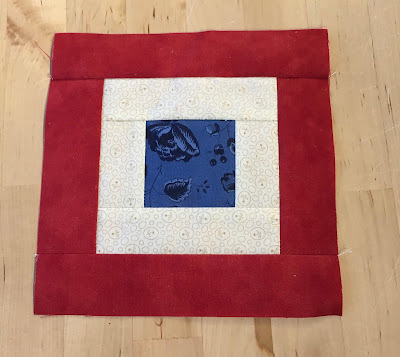 I made a cutting mistake and made my block too small. It was still pretty good, but too small. I added a 1/2" border all the way around. Lemons into lemonade, people. I just got back from another fun filled, inspiring International Quilt Market in Houston. We showcased our new collection Crystal Lake. Crystal Lake will be in shops in February. 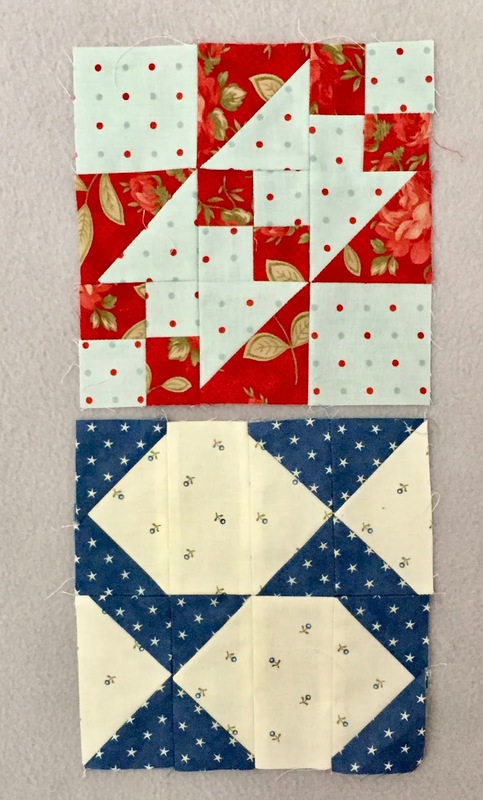 If you go to my Instagram and post a comment before midnight November 7th - you could win these fabric sets - along with a gift from Moda Fabrics. 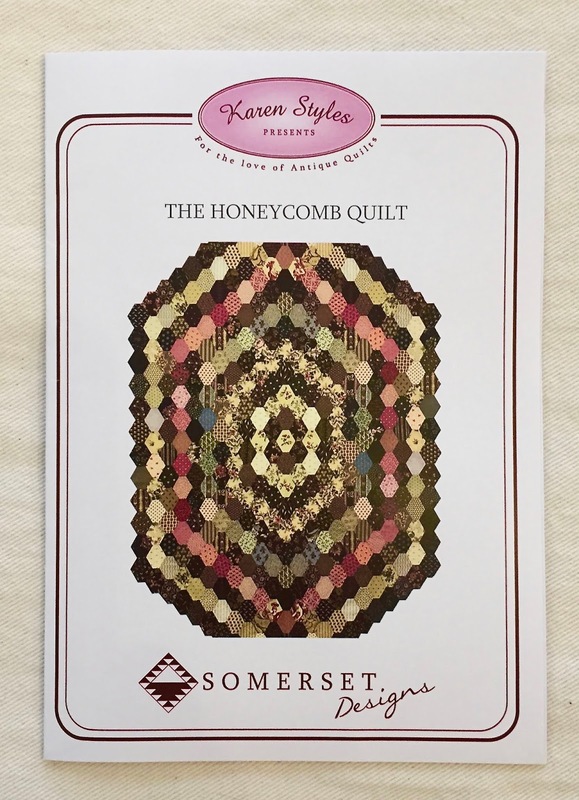 For all of you hand piecing people - I found these new patterns from Karen Styles of Somerset Patchwork - The Honeycomb Quilt. You can find them HERE in our Etsy shop. No, this isn't block 29. This is my in progress quilt. 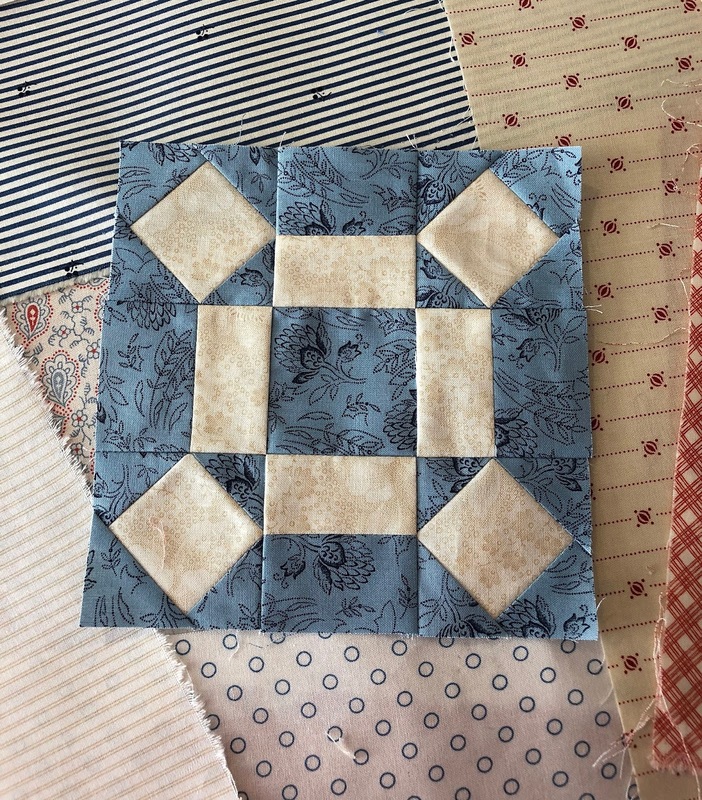 I am working on the borders right now and by the time Thanksgiving has rolled around, I plan to have this in my lap every evening - hand quilting it. The pattern is called Indigo Revival (the first one I made was in blue and cream). You can find the pattern HERE. 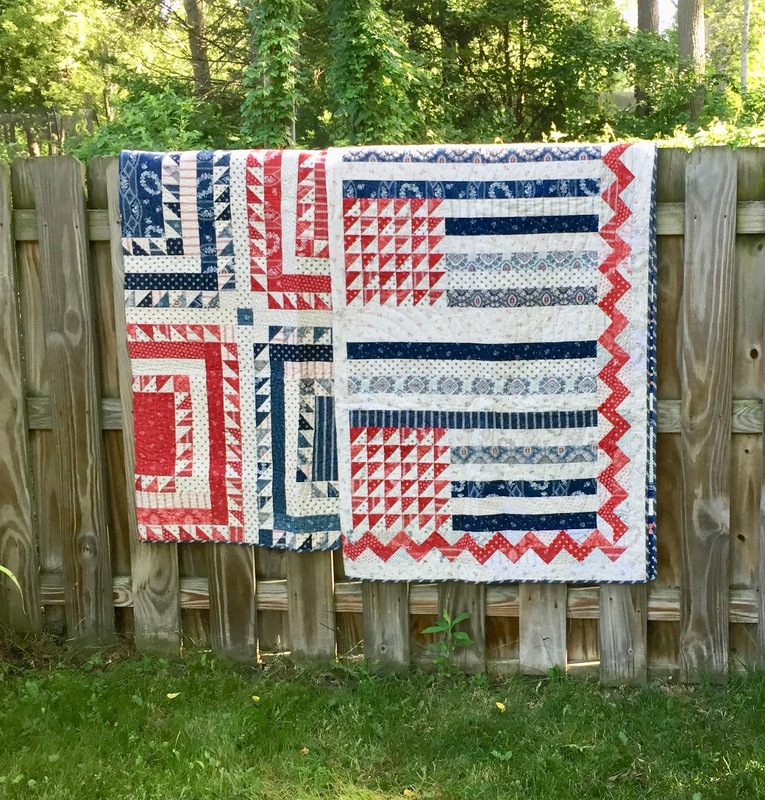 I always liked this quilt, but wished it was bigger. I just enlarged the block size and the templates 150% and now it will be queen size. There was also the issue of overflowing red scrap bins. This made a small dent in them. This is block 29, brought to you by Carrie Nelson. You can find the instructions HERE. Today I pack for Houston and we head to the airport at O dark thirty tomorrow morning. Hope to see some of you there. This week's block is brought to you by Me and My Sister - the directions are HERE. 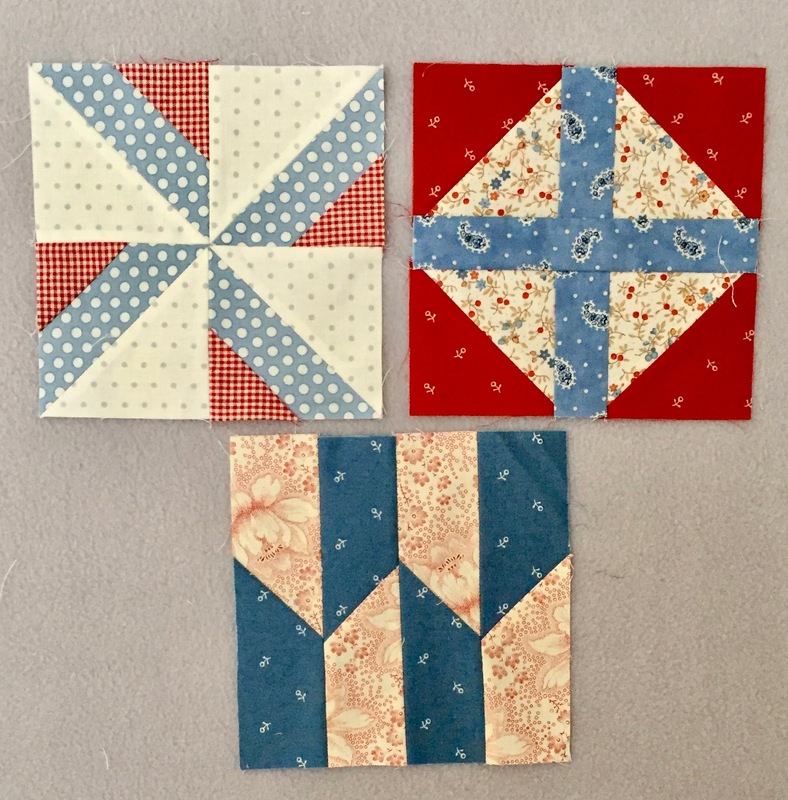 There are scraps from Prairie Paisley, Bar Harbor, and even some Bonnie and Camille polka dots! I found this treasure this past week. 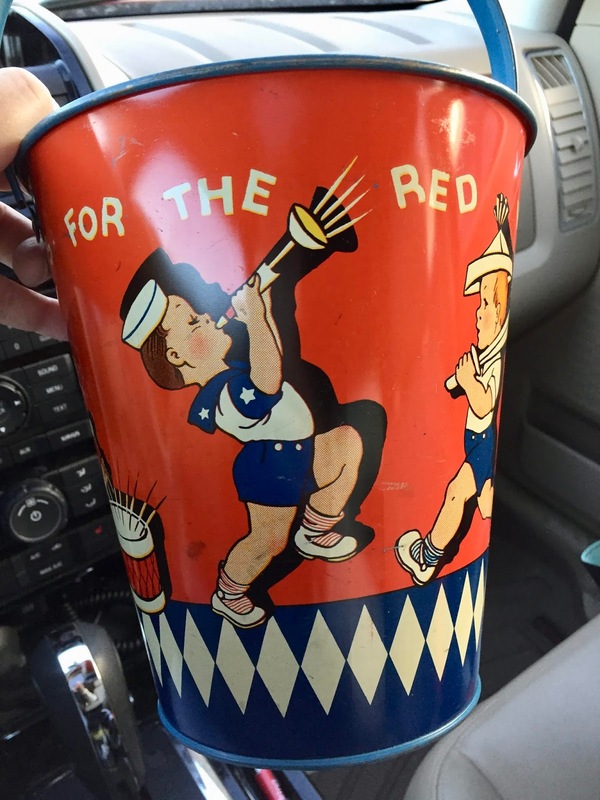 It isn't as old as the sand pails Polly collects, but this pristine one from the 40's/50's is a keeper. Those white Mary Jane shoes with the striped socks are calling out to me. Do you think Nordstroms has something like this in my size? 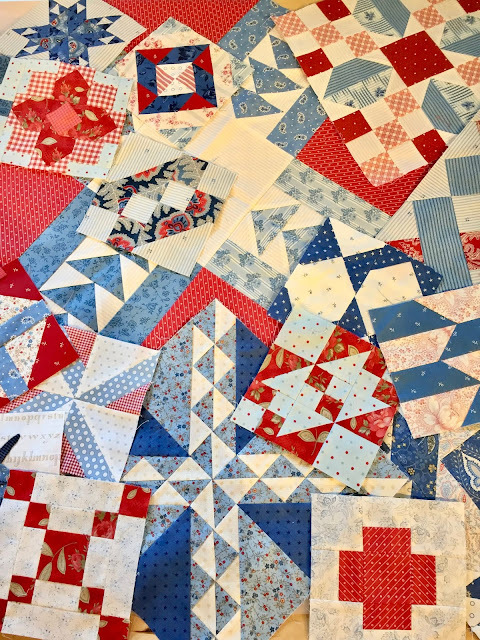 There are 2 quilts in progress here at Casa Simpson....... the first one is a remake of our Indigo Revival pattern, but in red and a bit larger. 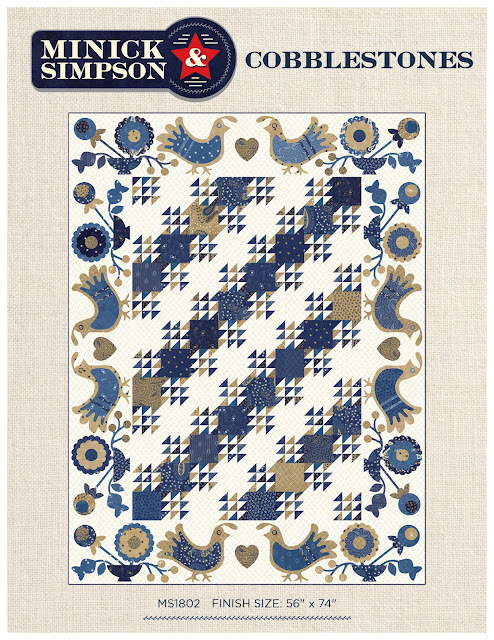 You can find the Indigo Revival pattern HERE. The second quilt in progress is one of those Top Secret quilts that get made here quite often. I can't share much more than this right now. More to be revealed at a later date. Can't wait to see how all of you make your Blockheads 2 block. The pattern is Indigo Revival and you can find it HERE in our Etsy shop. 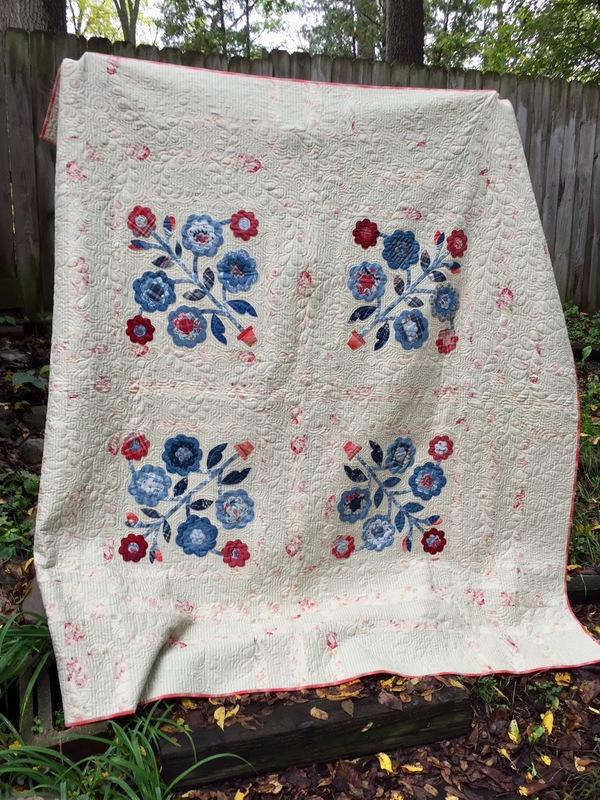 The original quilt (which has always been a favorite) was in blue and cream and wall size. I enlarged the pattern 150% to make it bed size. 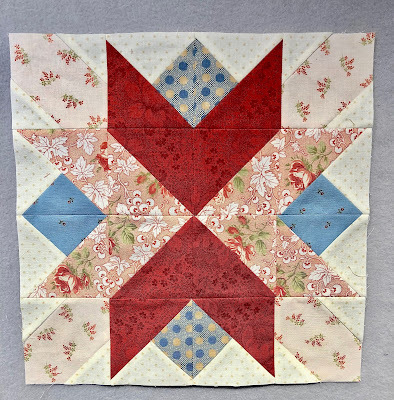 The blocks now finish at 15" square and the original was 10" square. It was easy to do, I cut my background blocks the new size and enlarged the 3 applique templates 150% on the copier. (the other applique figures will be in the border). 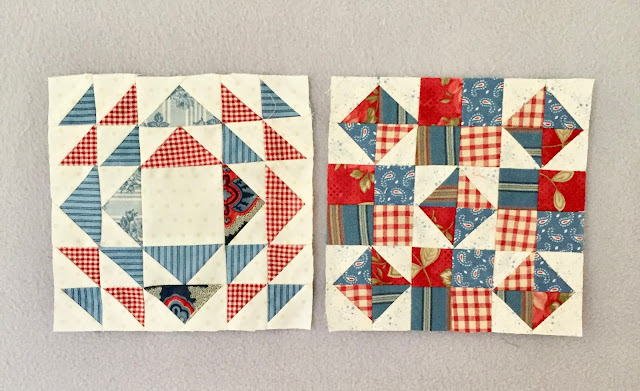 I loved the original in blues, but I like red too and the overflowing bins of red scraps helped me make up my mind. Hope you are enjoying the fall weather (or spring for those of you in the southern hemisphere). I am sipping hot drinks and wearing sweaters. It's glorious. Bill and I are having our annual battle (eh, ......discussion) about temperature in the house. He's walking around with ALL of his clothes on and grumbling. He would like the furnace turned on. I am happy with the cool temps and all I have to decide is on what sweater I will wear today. 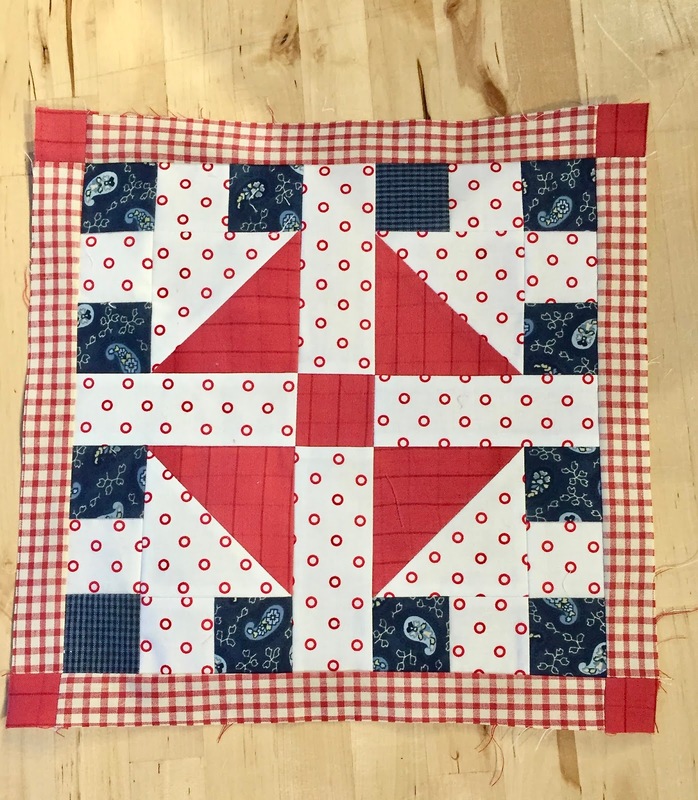 And there are always quilts to layer with. Lots of quilts. Layering is much more fun than central heating. We're halfway through with the Blockheads 2 blocks with 25 & 26 - brought to you by Lisa Bonjean and Corey Yoder - instructions are HERE and HERE. With half the blocks done, it's all downhill from here. Fall has been playing hide and seek here in Michigan. We had some lovely crisp, cool, windy days last week, but today we are back to a humid 80 degrees. It looks like after a few days of storms, sweater weather really will be here. I pulled out this sweet quilt a few days ago. It's called Summer Roses and was in this book - American Summer. I have a sale on American Summer books in our Etsy store. You can find it HERE. The book has patterns for 2 quilts, 1 beach bag cooler, and many hooked rugs. Oh, they may not be perfect, but good enough for me. There is a whole lot of pieces in these 6" blocks. I would recommend 1" finished HST papers for these guys. 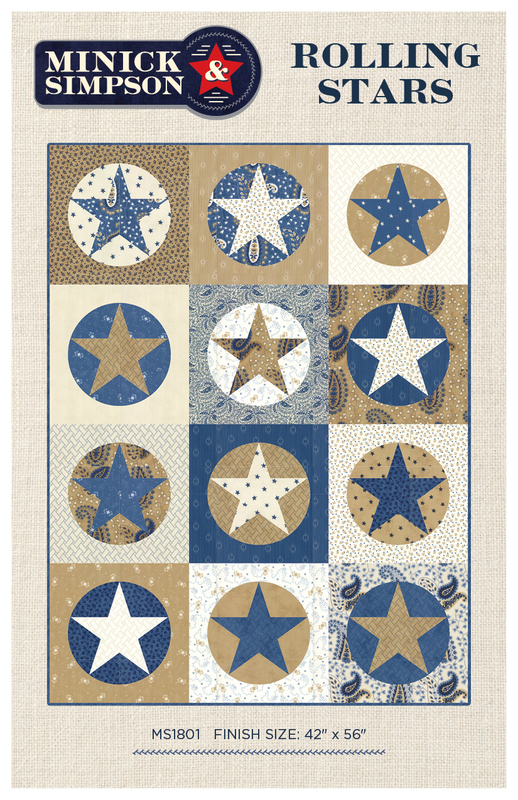 I like to use Spinning Star Design papers, but there are lots of others out there. I just got back from Hearts to Holly in beautiful Charlevoix Michigan. I'm unpacked and ready to get back to work. Fall has landed here and the t-shirts, the linen slacks, and the desktop fans have been put away for a few months. I hope to have more for you next week. The calendar has rolled around again to highlight one of my blocks - and one of Jan Patek's blocks. I have called Jan the queen of applique. I will do so again. Once I find a motif I like - I stay with it. So this is the same plus block we did a few weeks ago - but in miniature. Both of these are 6" blocks, and Jan's instructions are HERE and mine are HERE. I would post a picture of all the blocks, like I usually do, but my design wall is being taken over at the moment. 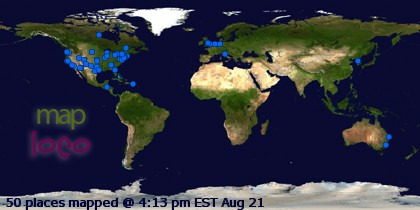 Also, it just looks a bit like the last few pics I have taken - a big 'ol mess of red, white and blue. Well, I have 3 new patterns up in our Etsy shop that feature our next fabric collection (being shown to shops right now) called Crystal Lake. Rolling Stars (Stars in Circles!!) is all pieced - for you non applique people. You can find the pattern HERE. Our Best Friends is a pattern for 2 mini quilts. You can find the pattern HERE. These are my blocks so far....... a big 'ol pile of red, white, and blue. In other news..... we have only a very few kits left of Hurrah! 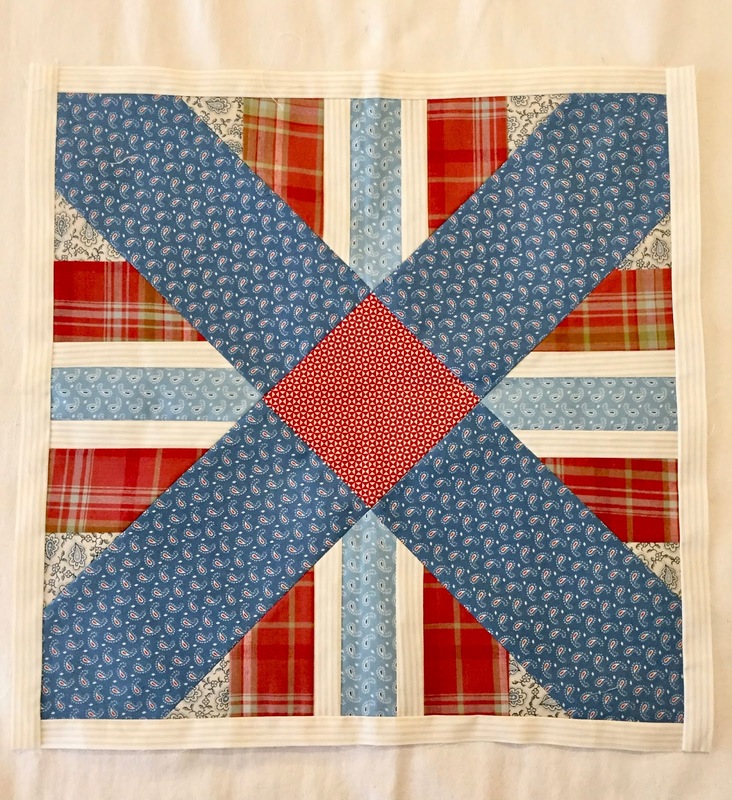 and Sweet William in our Etsy shop. In between finalizing patterns for our new collection, cutting fabric, and everyday nonsense.... I started my next long term project yesterday by picking out the fabrics. What prompted this? Well, I had no hand work for the evening (until the next set of patterns and fabrics appears) and needed something to do in between all this. What else prompted it? 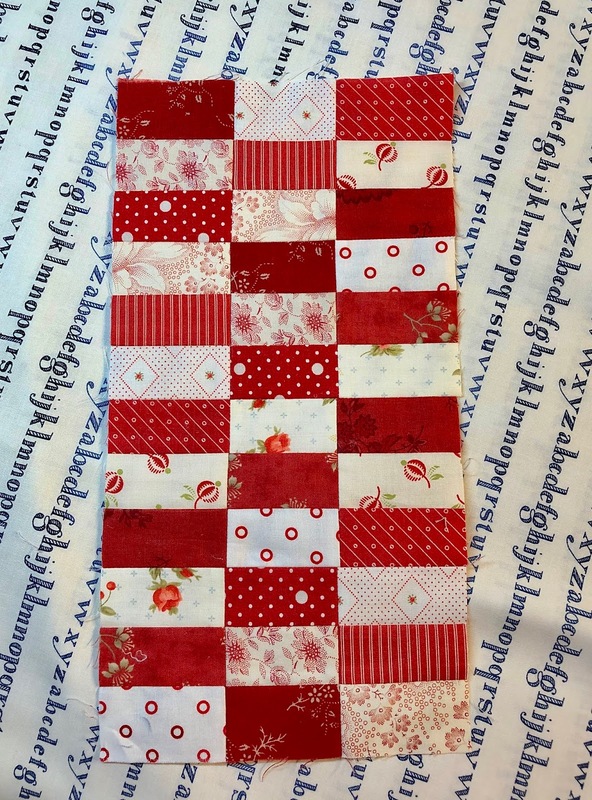 An overabundance of red fabric scraps that needed to be taken care of. This will be my next applique quilt. 29 different Minick and Simpson reds and creams and 1 Bonnie and Camille polka dot. We are moving right along and we have THREE blocks today. 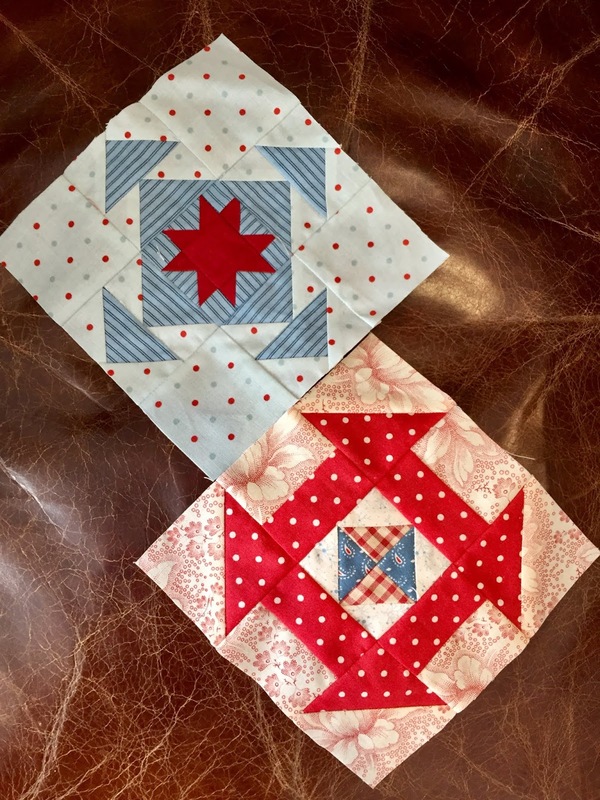 Have I told you my RULE for this BLOCKHEADS2 quilt? My rule is that I can't cut into yardage. Everything is made from my scrap bins. Actually that's a rule for just about every personal quilt I make. There's 2 reasons for that: 1, it's more fun and 2, it's a daily battle to control the scrap bins. But, as you can see.... the bins are so well stocked that a controlled pallete isn't hard to find. My quilt - my rules. Where are the Bella Solid blocks you ask?? 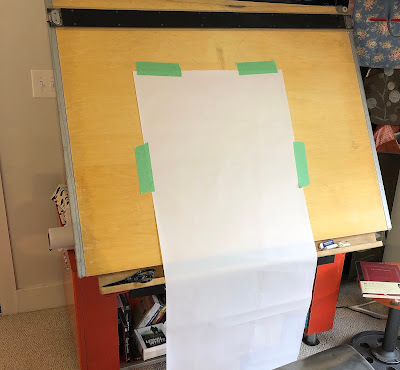 Well, I'm getting a bit crunched for time on some other projects - so I'm just focusing on one for the moment. What was I THINKING, anyway? What else is going on?? I've gotten emails from UPS that lots of Portsmouth fabric will be landing tomorrow. I'll spend the rest of the week cutting up fabric. Rotary blades are at the ready! Sweet William and Hurrah! are in our Etsy shop. 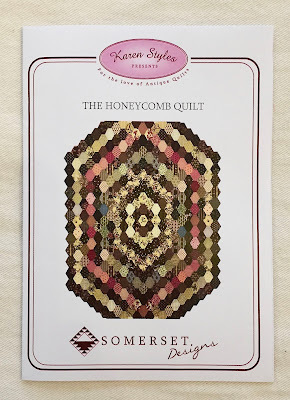 You can find the kits HERE and HERE.